Home » Blog » How to clean kilim carpet? Kilim is a special type of a carpet we usually know from Eastern Europe and Asia. It is known as a hand-made decorative rug with a beautiful look and amazing warm surface. 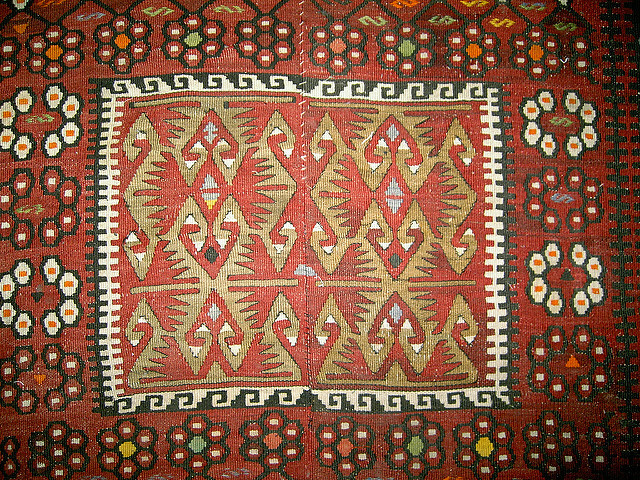 In most cases, a kilim carpet is made of natural materials and fibers. This makes it even more beautiful, but also more difficult to be maintained. The thing is that many of you common carpet cleaning actions should be avoided, permanently excluded or reduced to minimum. Meanwhile, it is essential for you to get to know the basics in taking care of kilim carpet. This is our topic today! Do not vacuum the fringes of the kilim carpet. They will tear or waste quite fast. Avoid turning the vacuum cleaner on the highest power rate. Fit in the medium rate and make sure you clean it thoroughly, but not often enough. This is how you are going to protect it intact and shiny for longer. Avoid using too much liquids and water for the washing. There are better alternatives for you – steam machines or commercial dry solutions. Use professional cleaning services once in a while. Even though not always cleaned by carpet cleaners, kilim carpet will be maintained in a decent condition for longer time. Avoid all-purpose cleaners in liquid condition. In most cases they contain bleach that is not very suitable for the kilim carpet. What to do, when I have to clean a stain out of a kilim carpet? Baking soda is always ok for pre-treating a kilim carpet stain – whatever it is. Just make sure you use it with a decent vacuuming procedure later. Also, consider applying white vinegar in all cases you have mud, grease or any organic stains. White vinegar has extra strong disinfection qualities. It is also a good stain remover and makes the colors look brighter and shinier! When removing a stain, try to blot, but not to scrub. If there are any visible excesses of the stain, try to scrape them off with a knife. It should be a sharp knife, but be careful not to tear the tiny and delicate fibers. Kilim carpet is a fantastic addition to your home interior. Have it with pleasure, but make sure you take care of it properly and regularly!